Russian President Vladimir Putin surprised Japanese Prime Minister Shinzo Abe on Wednesday by proposing that their countries conclude a post-World War II peace treaty "without any preconditions" by the end of the year. The abrupt proposal would effectively mean shelving bilateral negotiations over the sovereignty of Russia-held, Japan-claimed islands, contrary to Tokyo's position that a peace treaty should come after the settlement of the territorial issue. "An idea has just come to my mind," Putin said at a regional economic forum in Vladivostok, which was also attended by Abe. "Let's conclude a peace treaty before the end of this year, without any preconditions." 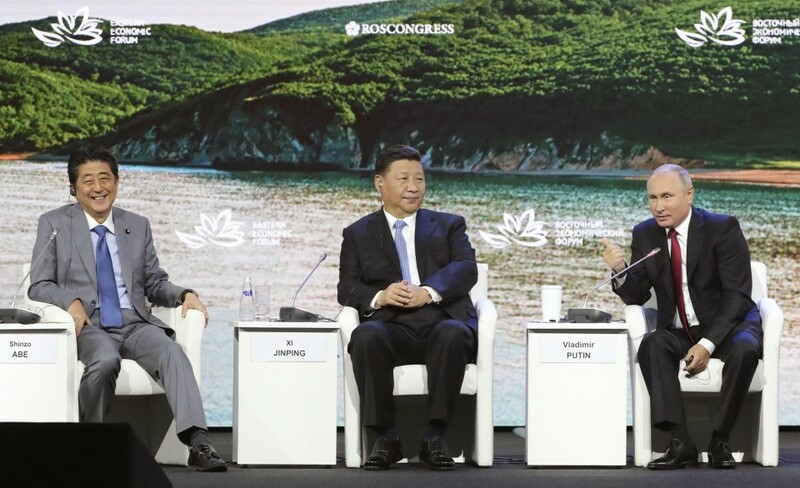 Putin said he wanted to clinch the deal first and then continue to discuss the territorial issue with Abe as "friends," during a question and answer session of the forum's plenary meeting in the Russian Far East port city. Putin made the remarks after Abe's speech urging him to bring an end to debate over the peace deal, which drew applause from the audience. While the Russian president said he "was not joking" about his proposal, it is unclear what Putin is driving at and what "without any preconditions" means. Abe, who was on the same stage, did not provide any response during the forum. The two countries have not signed a peace treaty in the more than 70 years since the end of World War II due to the territorial dispute over a group of islands off Japan's northernmost main island of Hokkaido. The two leaders have met 22 times and took up the territorial issue during the latest talks on Monday in Vladivostok. In Tokyo, Chief Cabinet Secretary Yoshihide Suga told a press conference that Putin did not make any such proposal during Monday's meeting with Abe. The top government spokesman also said Japan will not change its position of seeking to resolve the issue of the islands' sovereignty before concluding the peace treaty with Russia. A senior Japanese government official said Tokyo will not lodge a protest with Moscow nor try to confirm Putin's true intention. Russian Deputy Foreign Minister Igor Morgulov said that Moscow is ready to hold a meeting to promote talks on the treaty, according to Russia's Tass news agency. "We are ready (to start) immediately. It depends on when our Japanese friends will be ready," Morgulov said, according to the news agency. The islands -- Etorofu, Kunashiri, Shikotan and the Habomai islet group -- called the Northern Territories in Japan and the Southern Kurils in Russia, were seized by the Soviet Union after Japan surrendered in World War II in August 1945. Japan and the Soviet Union signed a joint declaration aimed at ending wartime hostilities and restoring diplomatic ties in 1956. In the declaration, Moscow agreed to return Shikotan and the Habomai islets to Tokyo once a formal peace treaty was signed. Tokyo has maintained that all the disputed isles should be returned. In an attempt to break the impasse, Abe has proposed a new approach since his summit with Putin in 2016. Japan is seeking to build mutual trust through bilateral economic cooperation in the Russian Far East and joint economic activities on the islands to pave the way for settling the territorial issue and eventually signing a peace treaty.